Natural angle: Close your eyes, clench your hands in a fist, relax, and put both arms forward and down a little. That is the natural position of your hands. They form an angle, called θf, viewed from the front, and another angle, called θt, viewed from the top. 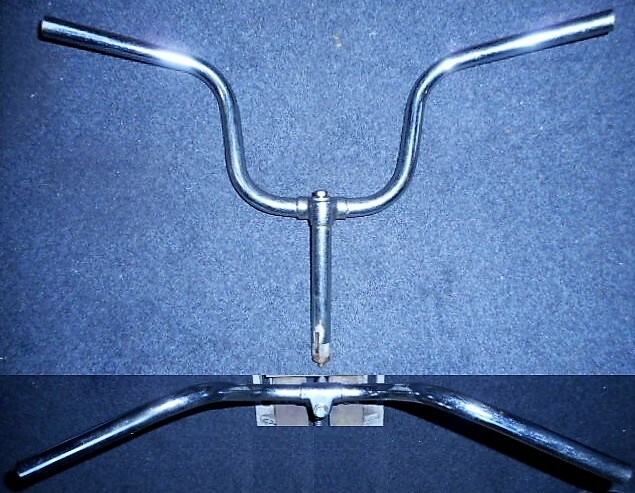 Handlebars are all close to the average natural position of human hands. Positioning: Clamp-on handlebars can rotate in the clamps. During installation the rider chooses the best clamping position, for comfort and control. 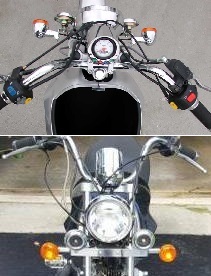 Most handlebars (except Clubman) are positioned with the rising part going straight up when viewed from the side. A rider with short arms might prefer a more rearward position, while a rider with long arms might want a more forward position. 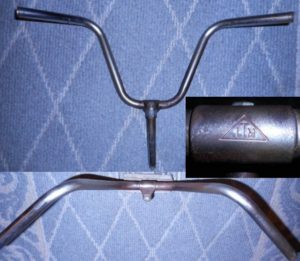 Flipping (inverting): Any clamp-on handlebar can be flipped over (inverted). But most will feel wrong and strain the wrists. 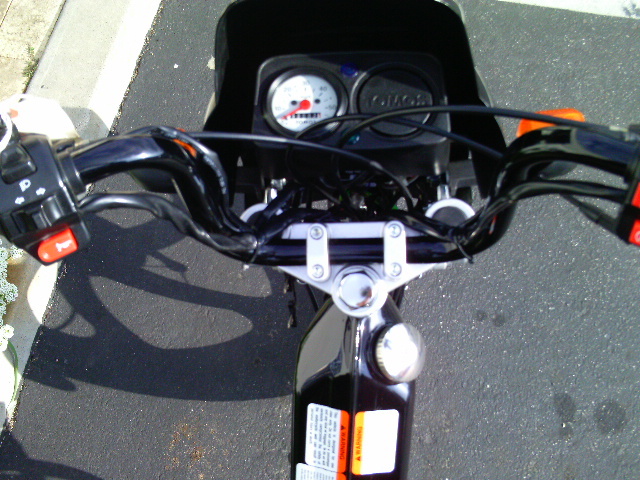 Of the handlebars shown below, only the Clubman and Drag bars can be flipped over, and still feel right. Dimensions are width, height, rise, clamp length, control length, pullback. Dimensions: Six lengths can completely describe a handlebar, without the need for angles. Here the side-view angle θs, and the top-view angle θt, are calculated from the lengths R, H, P, L, W, and C.
Measuring: When measuring the dimensions, the end points are at the centers of the tubes, not the edges. 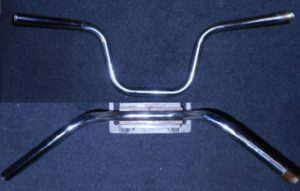 The handlebar is placed on a flat table. With the rises vertical, the rise and height are measured from the center of the bar, straight down to the table, with 1/2 of the bar width subtracted (-0.4 inch). With the rises horizontal, the pullback is measured similarly. 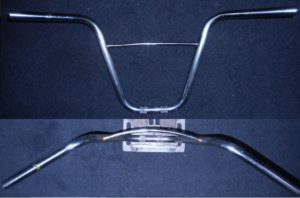 Height: Looking from the front, most handlebars, especially low ones, slant down slightly going outward, at an angle θf, because the height is less than the rise. On some handlebars, the height is greater than the rise, and θf is negative. Pullback: Looking at most motorcycle bars from the top, the bars slant rearward, at an angle θt, because the pullback is greater than zero. When the pullback is zero, θt becomes zero. 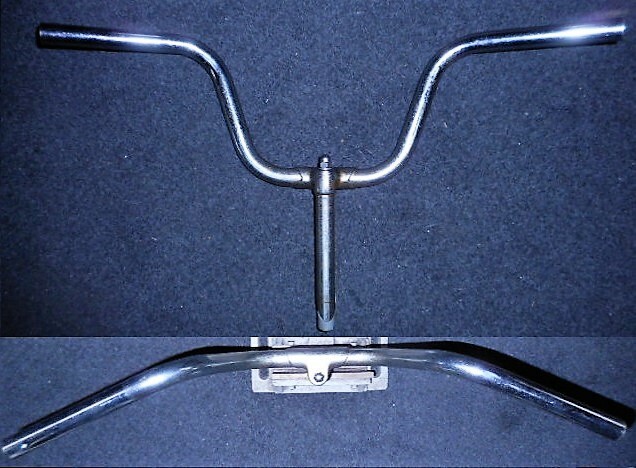 Cruiser bars are for comfort and have a large pullback, where the bar ends point more towards the back of the bike. Drag bars are for high powered acceleration, and have a small pullback for control and grip. 2D or 3D: When the pullback is zero, the handlebar is 2-dimensional and will lay completely flat. 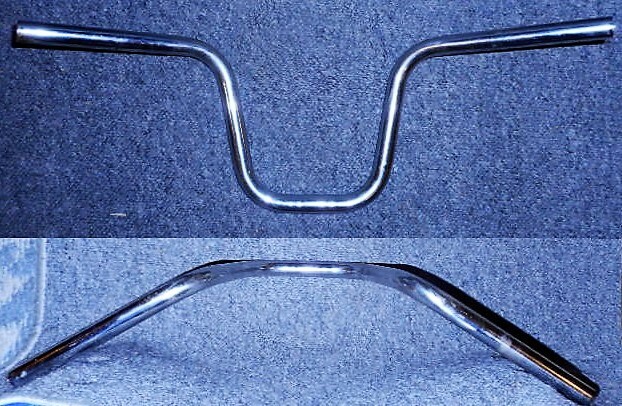 Otherwise, most 4-bend (non-Drag) bars are 3D and do not lay flat on a table. 2D handlebars are simpler to make, but don’t feel “right”, except maybe at one particular position. 3D handlebars are more complicated to make, but will feel “right” in a range of positions. Width: Wider handlebars allow better control. Off road bikes have wider bars. Narrow bars have less control, but are more aerodynamic for better fuel economy or higher top speed, and can squeeze through smaller spaces, like in between stopped cars. Rise: High rise handlebars are taller, and put the hands higher. This can position the rider’s torso in a more upright position, for helping with back pain. Higher bars allow better control when standing up, like when jumping or hitting pot holes. 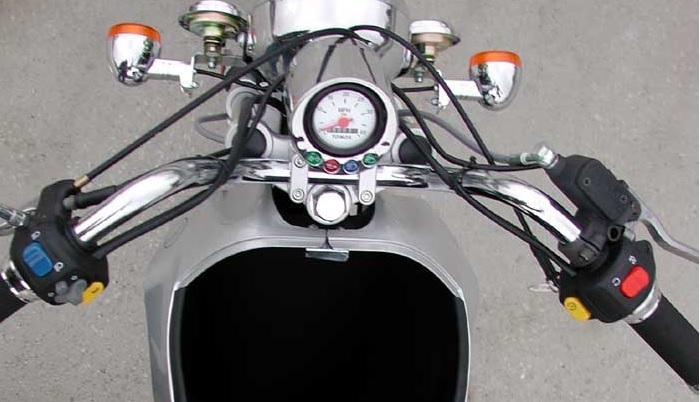 Low rise handlebars put the rider leaning more forward. That reduces wind drag for higher top speed or better fuel efficiency. 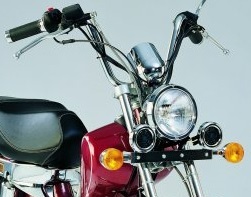 Control length: Motorcycle handlebars need about 3 inches more control length than bicycle handlebars. They have thumb-operated levers or buttons, in addition to the finger-operated hand levers. Motorcycles have a twist throttle and a hydraulic brake on the right that takes up space. For motorcycles the minimum control length is roughly 8 inches. 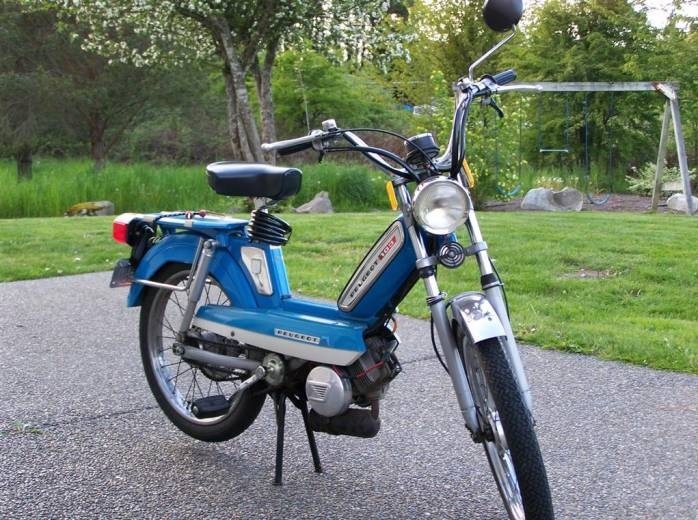 For mopeds it is about 6 inches. For bicycles it is about 5 inches. 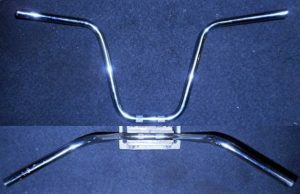 Any handlebar that has extra control length, can be cut shorter, up to the minimum control length, to reduce it’s width. 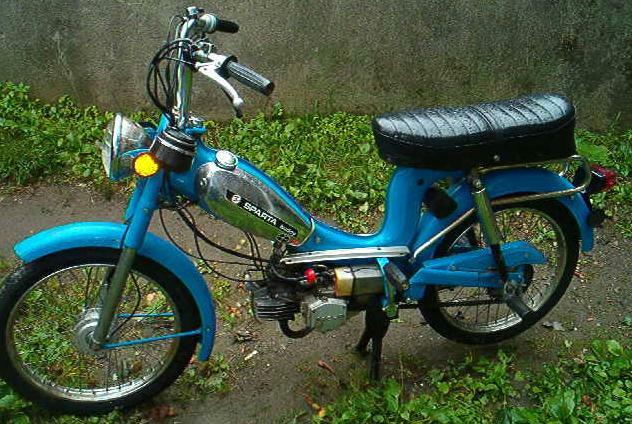 Applications: Not all mopeds can accept clamp-on “universal” handlebars. 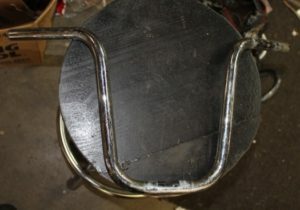 Some mopeds have bolt-on handlebars, where there are plates welded to the bar that bolt to the fork. 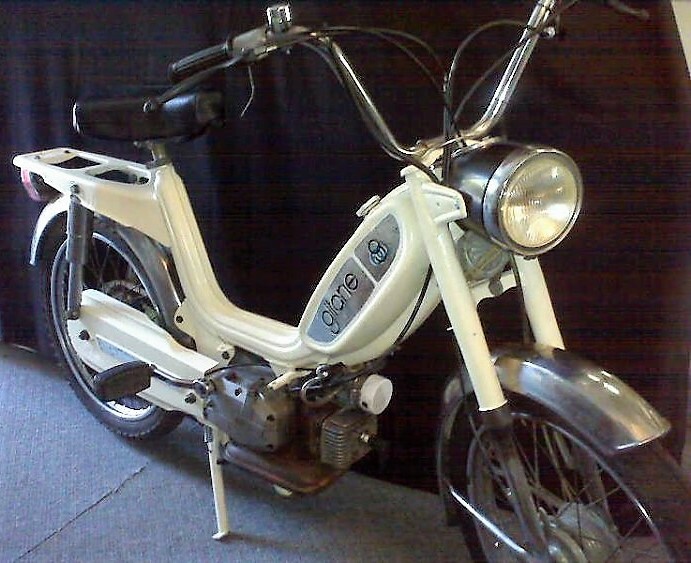 Some mopeds have stem-mounted handlebars, where there is a long neck that goes inside the fork, held by a wedge bolt. 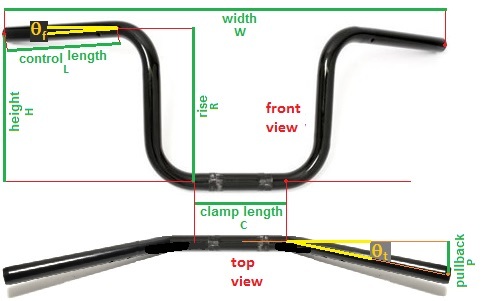 Thickness: Most modern 7/8 handlebars are 0.875 inch = 22.2 mm. 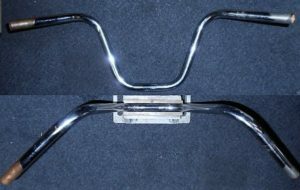 Vintage metric handlebars, are 0.863 to 0.866 inch = 21.9 to 22.0 mm. The dual standard can sometimes cause problems. 22.0 controls on 22.2 bars: Wedge type controls, such as Domino, for 22.0 bars cannot fit on 22.2 bars. 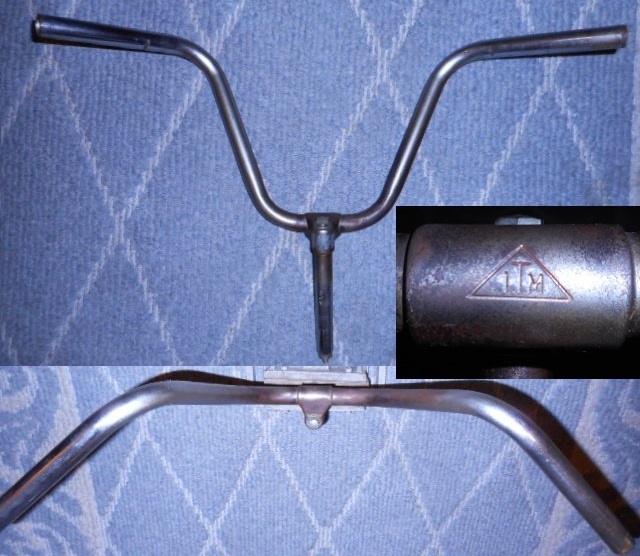 Wedge type controls do not clamp, but instead press a cone into the bottom of the handlebar. 1960’s, 70’s and 80’s “vintage” Domino controls have a fixed size hole, 22.0 mm, for 21.9 bars. 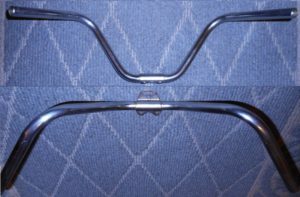 22.2 controls on 22.0 bars: Original vintage handlebars 22.0, with 1970’s Magura clamp type controls, require a strip of aluminum can under the clamp, to hold solid onto the handlebar. Otherwise the throttle slips around the bar. 1990’s and 2000’s “modern” Domino wedge type controls have a 22.3 mm hole, that works fine on either modern 22.2 or vintage 22.0 bars. Bikemaster new replacement handlebars for mopeds are made in chrome or powder coated black. The thinner chrome fits into all clamp type, all modern wedge type, and most vintage wedge type controls. Some vintage 22.0 mm controls require sanding of the high places on the 22.07 mm chrome handlebar. Often the bar is to wide at the sides, but not at the top and bottom. It is difficult not to scratch the exposed area. The thicker black powder coated bar fits Magura clamp type controls, but can interfere with wedge type controls. With Italian made Domino wedge type controls, the thicker 0.89″ (22.6mm) bar does not fit into the fixed-size hole (modern 22.3 or vintage 22.0 mm). 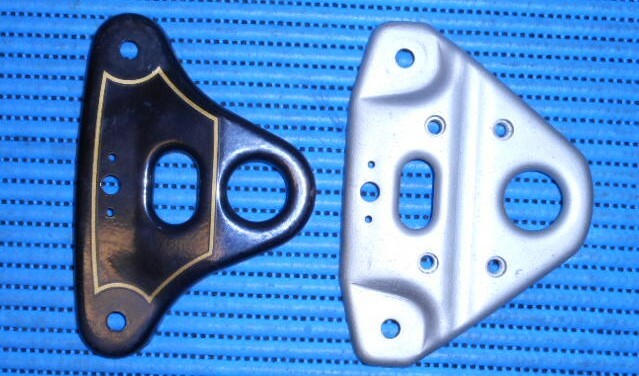 The black powder coating can be sanded off, to reduce the thickness. But it is difficult to not scratch the exposed area. These bars have plenty of control length, 8 inches. 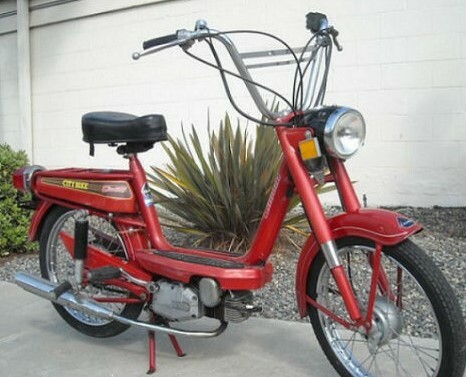 Most mopeds only need 6 inches. So each end can be cut 2″, to reduce the overall width by about 3″, from 30 to 27″. 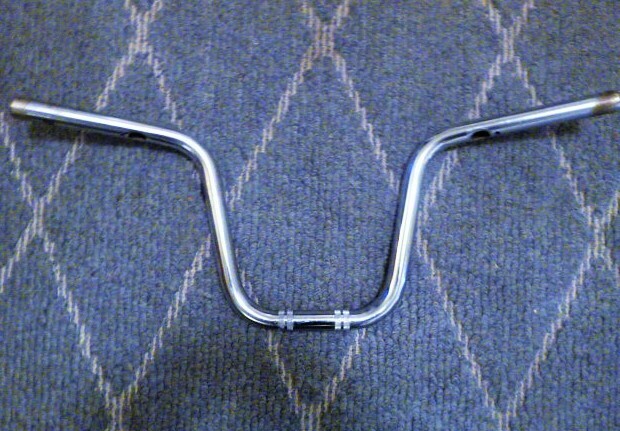 These bars have plenty of control length, 9 inches. Most mopeds only need 6 inches. So each end can be cut 3″, to reduce the overall width by about 5″, from 29 to 24″. These bars have plenty of control length, 8 inches. Most mopeds only need 6 inches. So each end can be cut 2″, to reduce the overall width by about 3″, from 29 to 26″. 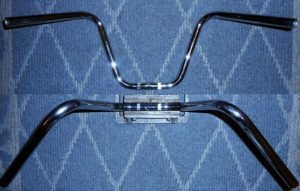 These are the only two-bend handlebar. All others have four bends. That makes them cost less. 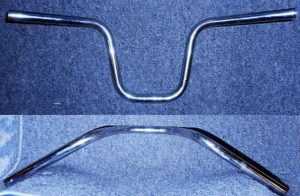 Most mopeds only need 6″ of control length, so 3.5″ can be cut from each end, to reduce the width by about 6″, from 28 to 22″. These bars are shown inverted, with the rises going upward. In this position the bars are higher, but still at an angle that feels right. Normally they are installed with the rises going down and forward. That position is what racing bikes have, for reduced wind drag. 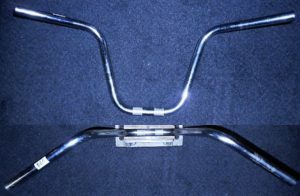 For mopeds that only need 6″ of control length, each end can be cut 4″, to reduce the width by about 6″, from 28 to 22″. 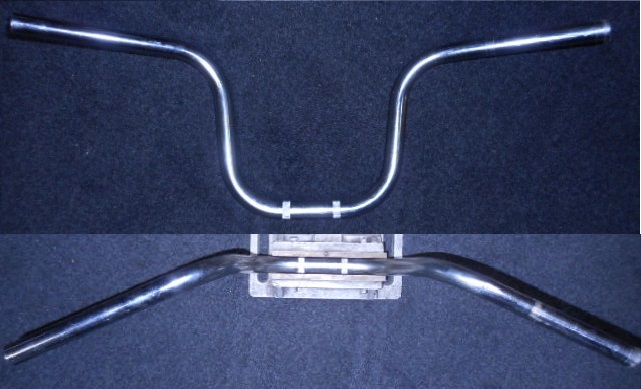 Most Original Equipment Manufacturer handlebars are available in a range of conditions. All are straight, unless noted. Some are new, some good used, and some are pitted, peeling or scratched. Some have tiny scuffs from being jostled around in parts bins. They are priced accordingly. Photos of actual choices are available, by email. These bars have a plate and a clamp. The clamp has the strength to hold the bar, while the plate keeps it in that one position. 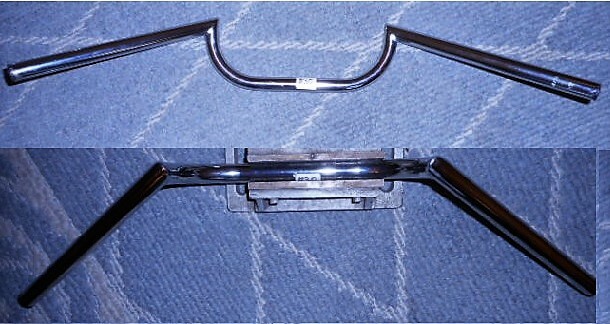 The clamp will still hold if the plate is cut off. Without the plate the bar position is adjustable. 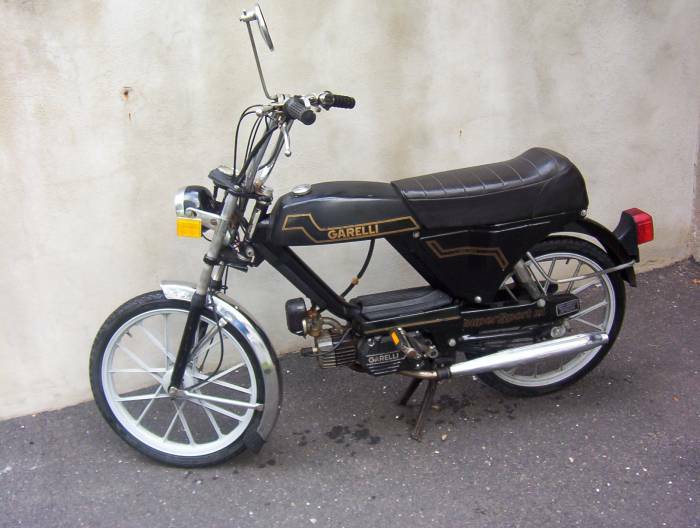 Curiously this Cimatti handlebar is made by Garelli. See the tilted G logo? 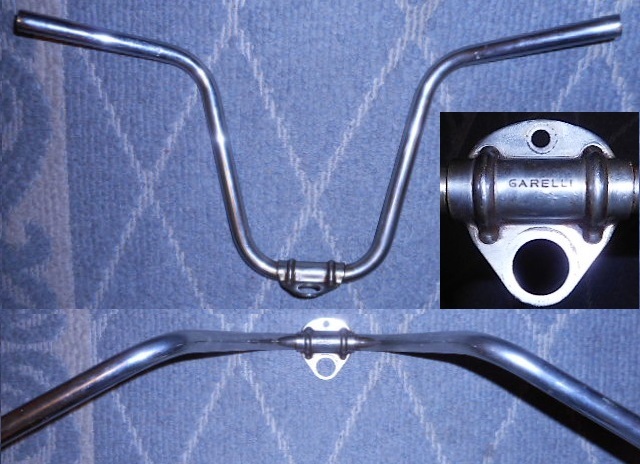 These bars are on 1975-79 Garelli mopeds. They can adjust up and down, by how far the stem is inserted. No photo available. None available. 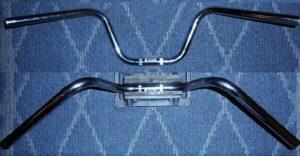 These bars are on 1977-78 Garelli Supersport XL and others. These bars are on certain 1978-79 models. 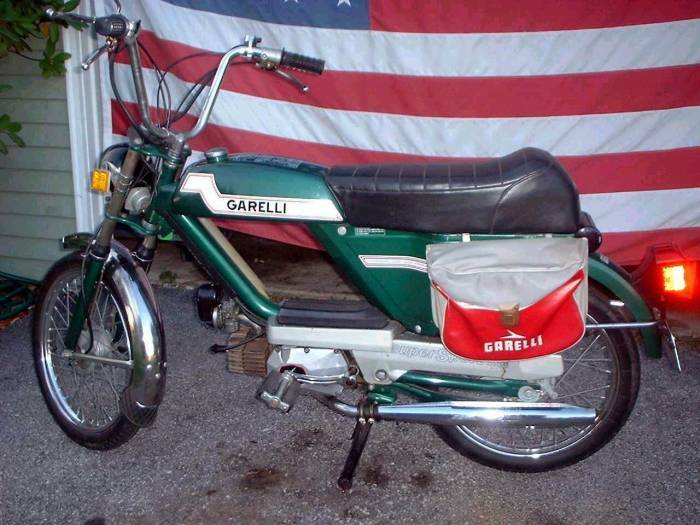 The bottom of the handlebar has a chrome steel plate that says Garelli. The chrome handlebar plate bolts to the painted fork top plate. The fork top plate is made of stamped sheet steel. 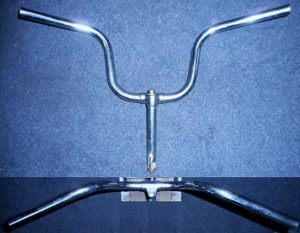 For these bolt-on bars the fork top plate was made too thin, causing most to crack near the edges of the handlebar plate. 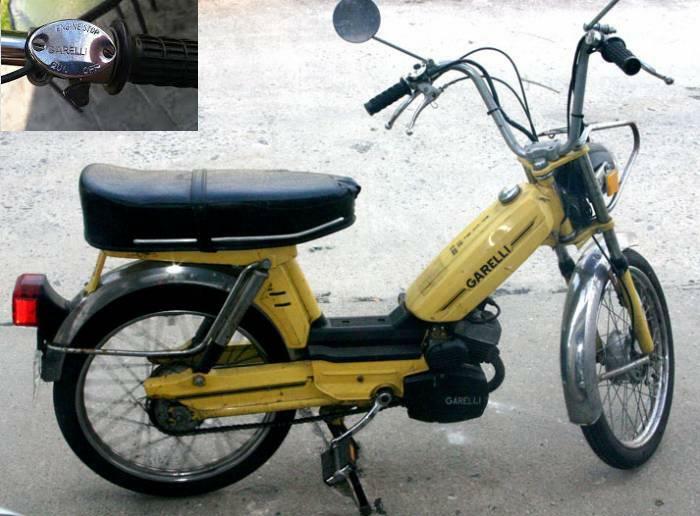 Garelli soon realized this problem, and stopped making the bars-with-plate design in 1979. 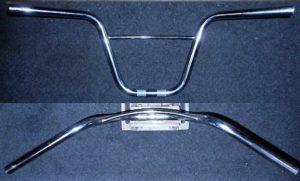 These bars are on most 1980-86 Garelli, US models, and 1978-79 VIP and LTD (mag wheel) deluxe models. 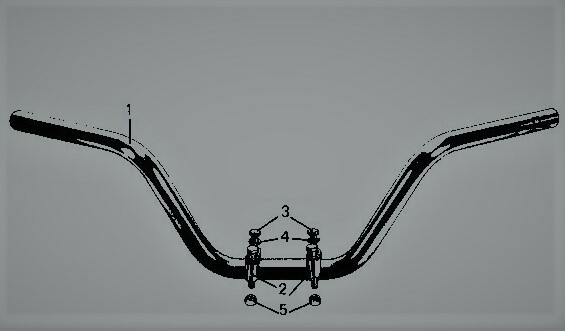 For about one year in 1978-79 all three handlebar designs were on Garelli mopeds, handlebar-with-stem, handlebar-with-plate, and clamp-on handlebar. 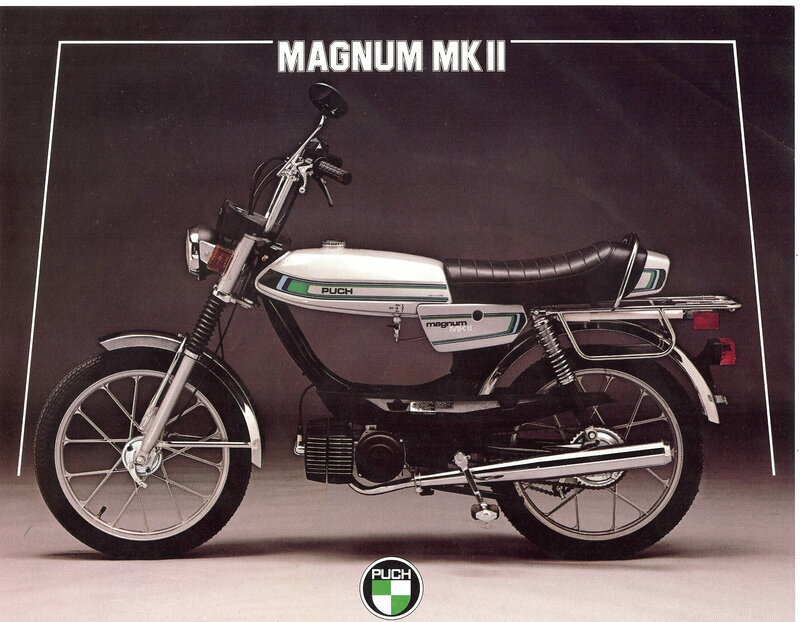 But by 1980, all models had the clamp-on handlebar design, with strengthened fork top plate that did not crack easily. The 1977-80 Gitane mopeds (US models) had this bolt-on handlebar. Many Gitanes (made in Italy by Testi) were from Southern California. These clamp-on bars are on 1987-83 Honda NC50 Express and PA50 Hobbit. They have large holes for the electrical wires to go inside the handlebar. They also have small holes for the little pins that hold the controls in a fixed position. They also have rubber-grommet covered holes for the throttle and choke or decomp cable. So altogether there are 7 holes. 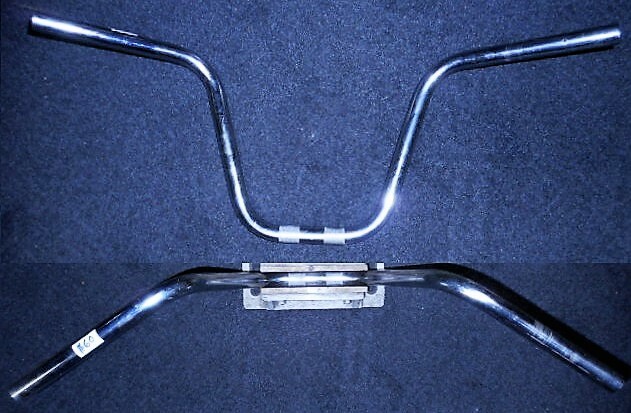 These clamp-on bars are on Kreidler Flory MP9 and MP19 mopeds. The handlebar has a short tab under the center, that fits into a slot in the fork top plate. 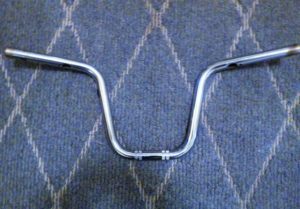 These bars are on 1975-1980 Motobecane mopeds, US models 7, 40, 50, 50V, Moby, Le Moped. 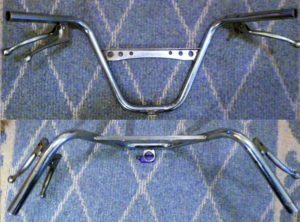 These bars are on Peugeot 103LS and 103LVS models. They are so scarce that no sample was available for a photo and measurement. 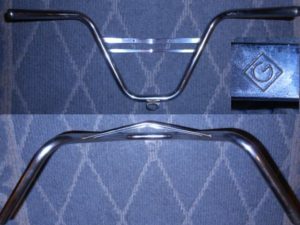 These bars are on 102SP and 103SP models. They have thin wall tubing, for light weight, but they bend easily. So unbent originals are scarce. 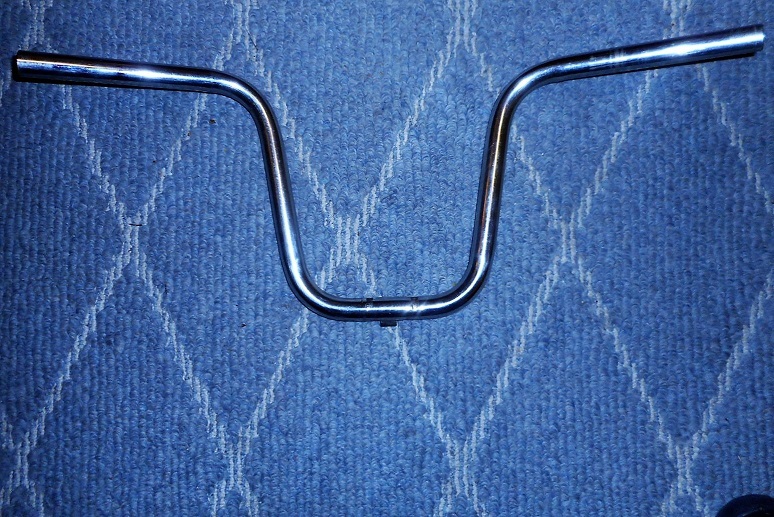 These bars are on early Puch Maxi models, 1969 to 1977. The height is adjustable by the position of the stem. 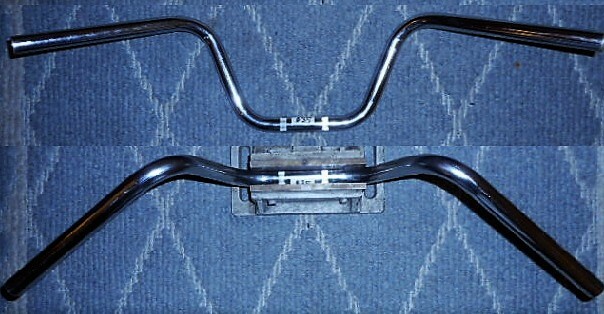 These clamp-on bars are on 1978-79 Maxi Luxe, Newport, Maxi II, and 1980-86 Maxi, Maxi Luxe, Newport II. These bars are the same as Maxi bars but taller. They are on 1977-78 Sport, Sport MkII, and 1984-86 Maxi, Maxi Sport LS, Maxi Sport LS 2. They are heavy because of thick wall tubing. 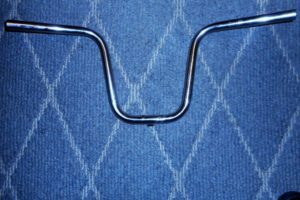 These bars are the same as tall bars, but have a curved crossbar. They are on 1979-86 Sport, Sport MkII and 1980 Magnum II. These bars are similar to Maxi bars, but shorter and with a curved crossbar. They are on 1978-79 Magnum XK, Magnum MkII. 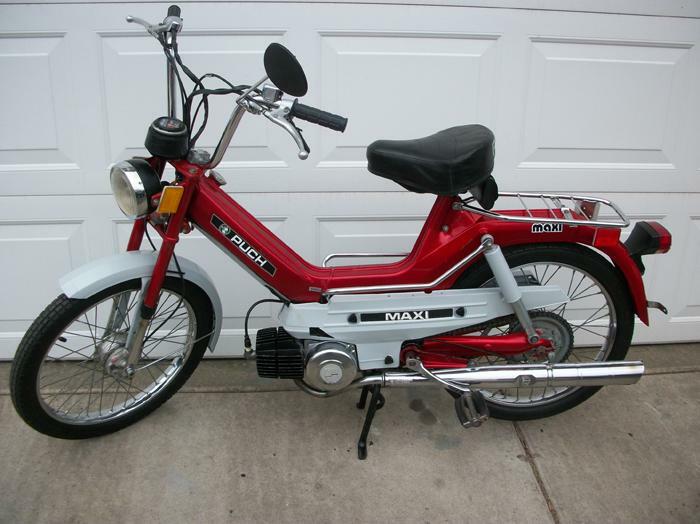 There are several mopeds with these handlebars: Sparta Foxi GT, Sparta Buddy, Sparta Lucky, Sparta Flying Dutchman, and others. These bars are the same as Batavus VA, Batavus Starflite, Batavus Regency bars, but with more pullback. They are made in Holland with high quality chrome that resists rusting. 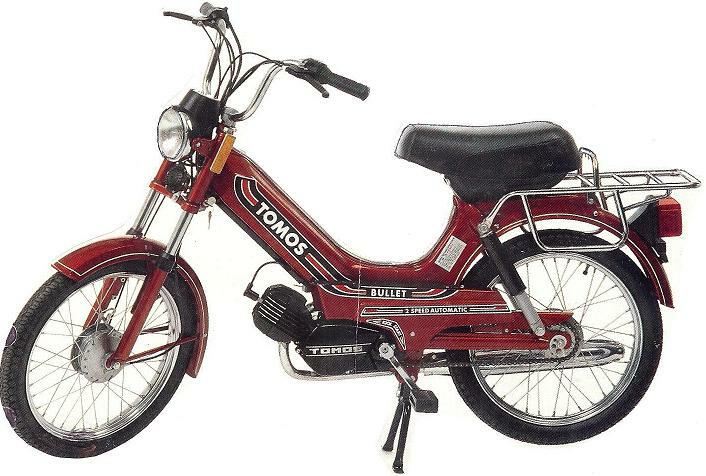 < These Tomos controls do not have a post, so the handlebar does not need holes. 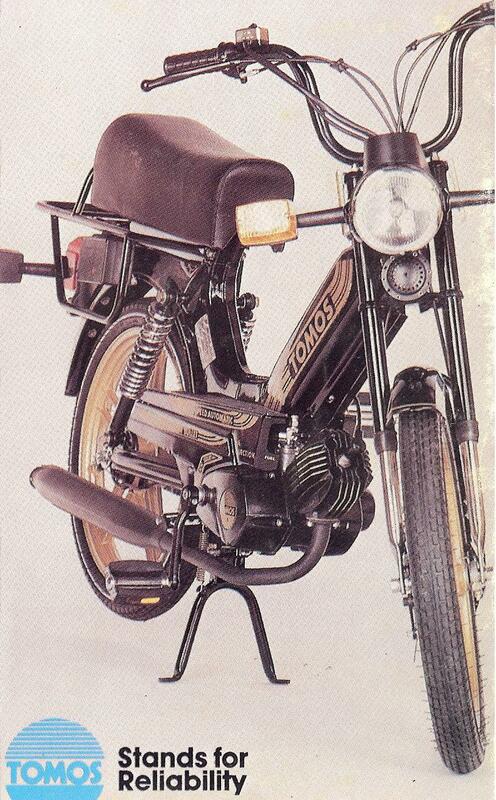 < These Tomos controls have a post that goes into a hole in the handlebar. When changing handlebars, holes have to be drilled. The holes have to be in a particular place to make the levers the same, and at the correct angle. 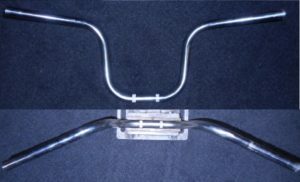 This stem type handlebar is what bicycles have. 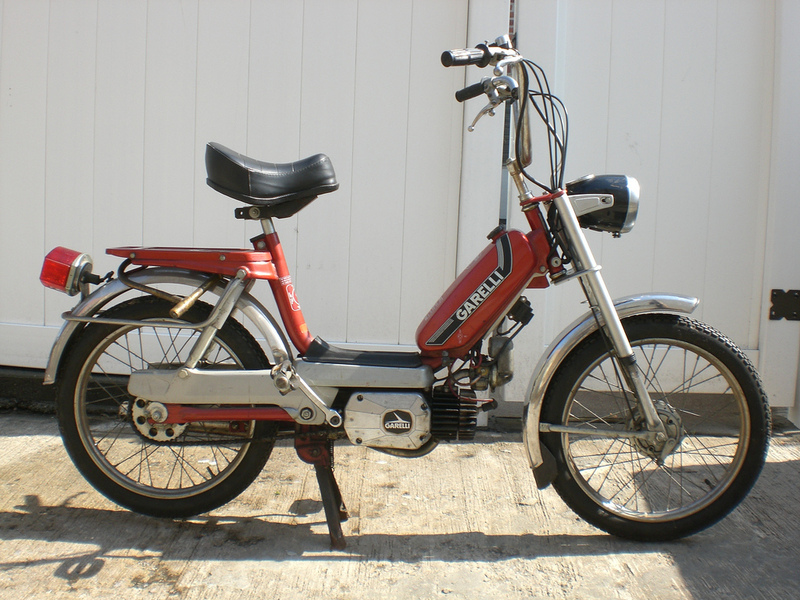 Older mopeds were more like bicycles. The stem can be positioned to make the bars higher or lower. These bars do not have the holes for 2008-13 controls. 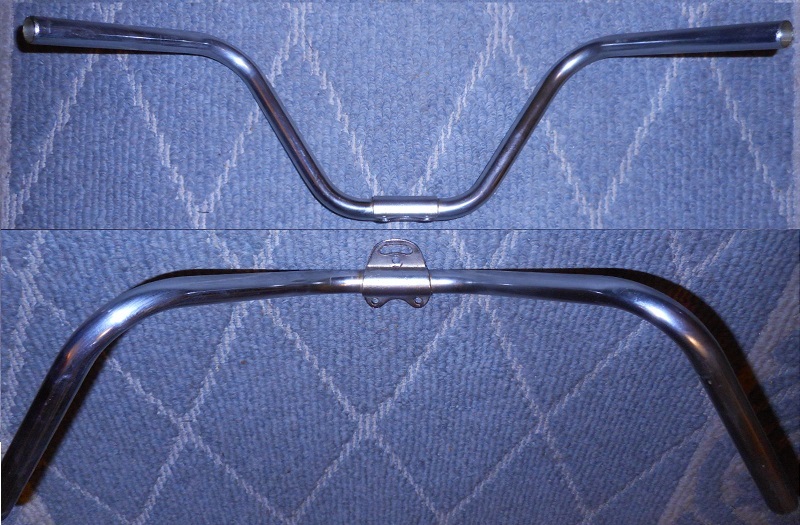 These bars have the holes for late-model Domino or TBS controls. These have holes for late Domino or TBS controls. 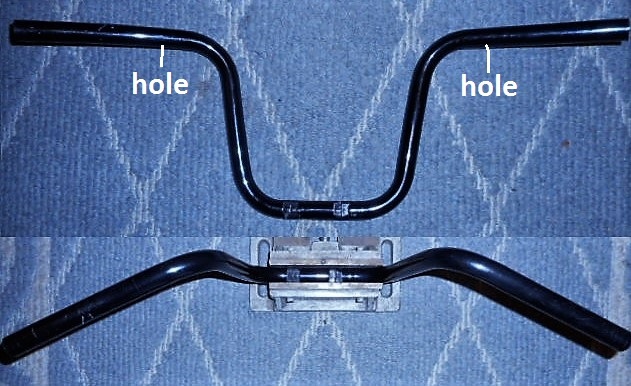 On most older mopeds the clamps are too close to the 1.7 inch long center bulge. 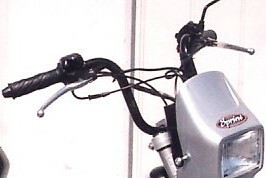 On 2008-13 Tomos, the forks are wider than vintage mopeds forks, and the handlebar clamps are spaced 1.7″, far enough apart . 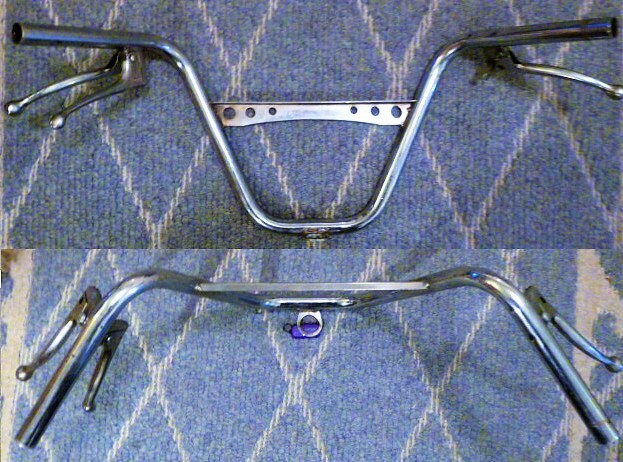 So the Wald 3346 handlebar fits pretty much only modern Tomos mopeds. 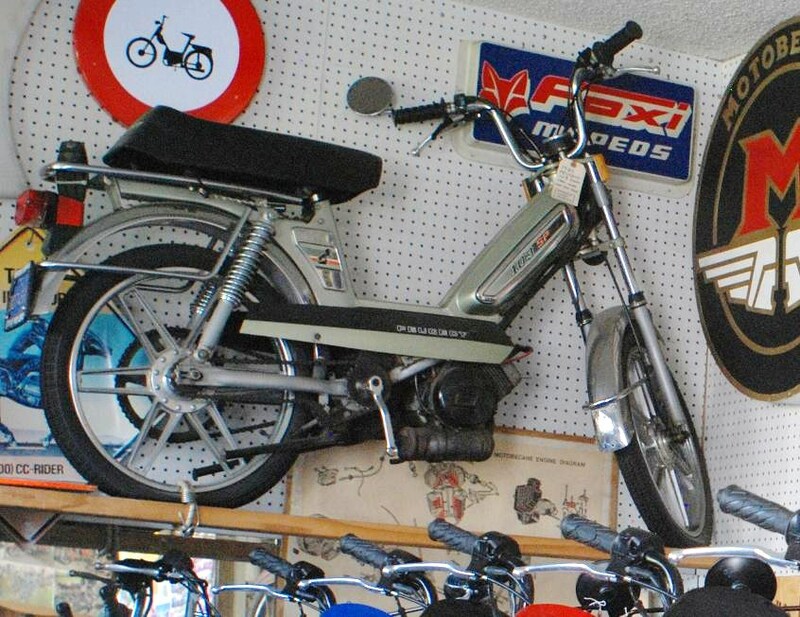 See the table of moped fork clamp spacings above. 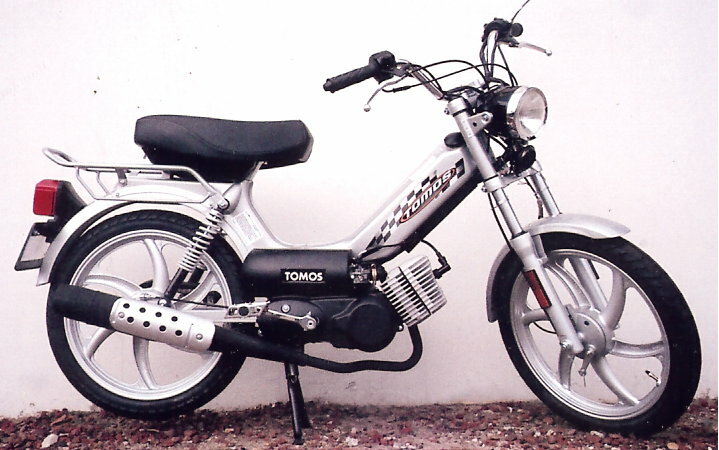 For 2001-13 Tomos controls made by Domino or TBS, holes must be drilled into the handlebar, because those controls have posts. But the fresh chrome gives a classic look, and the height is sensible. 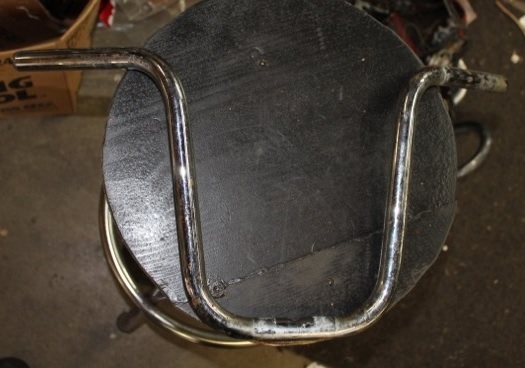 Size: Almost all small motorcycle left (L) grips are inside diameter 22mm (7/8″), to fit the bare handlebar. 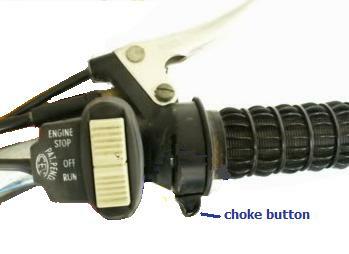 Right (R) grips are ID 25mm (1″) to fit the throttle twist tube. 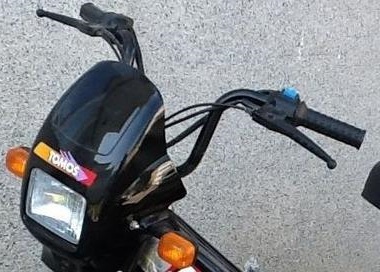 Moped grips are shorter than most motorcycles. The left side doesn’t matter, but the right side does. 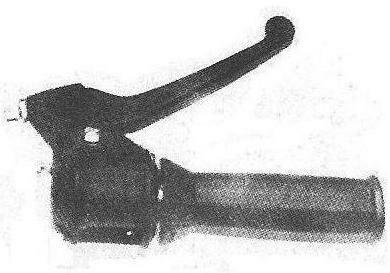 When the left grip is longer, the lever housing (perch) is moved over to make room. When the right grip is longer, it must hang over the end, or possibly make the throttle stick. Standard motorcycle grips are 115 to 130mm (4½ to 5¼”) long, or more. 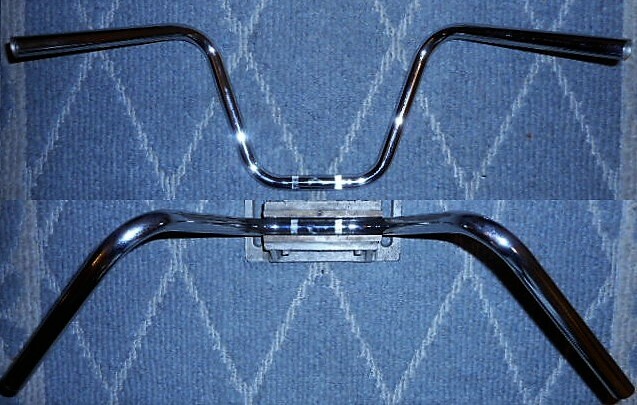 Vintage moped grips are short, 100 to 115mm (4″ to 4½”). There’s not a big selection in the shorter size. OEM grips: Original equipment grips, some new and some used, are offered for “correct” restorations, when modern replacement grips are not desired. Many original grips are not for sale, but are shown for reference. OEM grips are usually made by the controls maker. 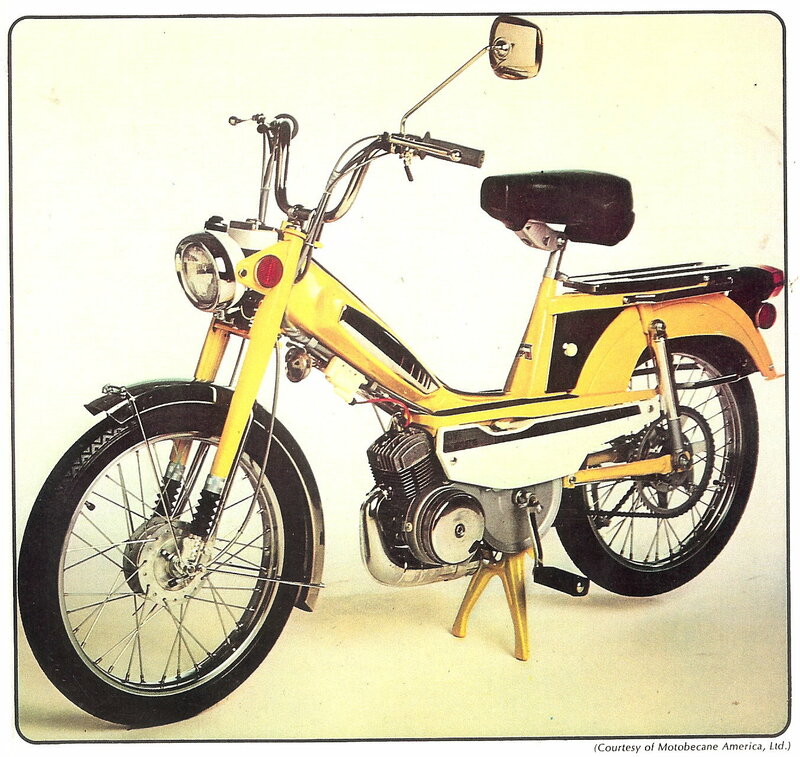 Below are the major moped controls makers. Motobecane controls are made in France. 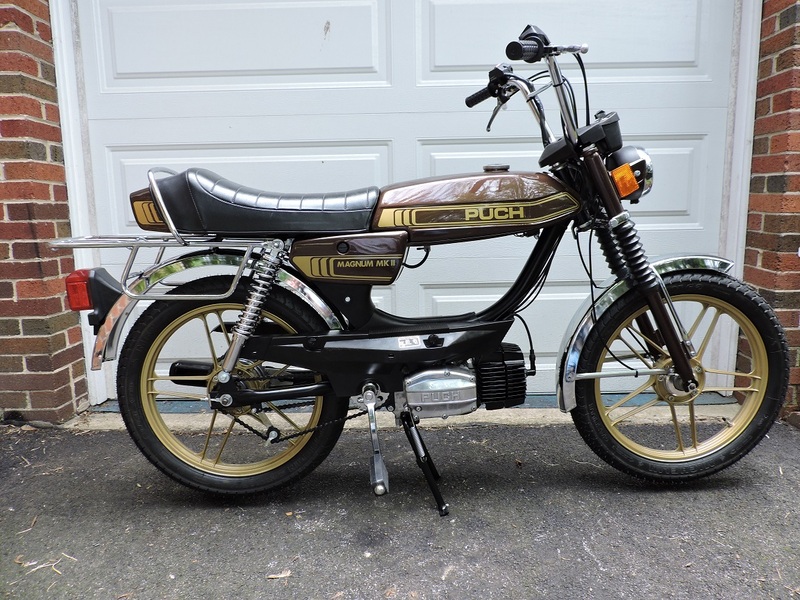 They are on 1970’s to early 80’s Motobecane mopeds. 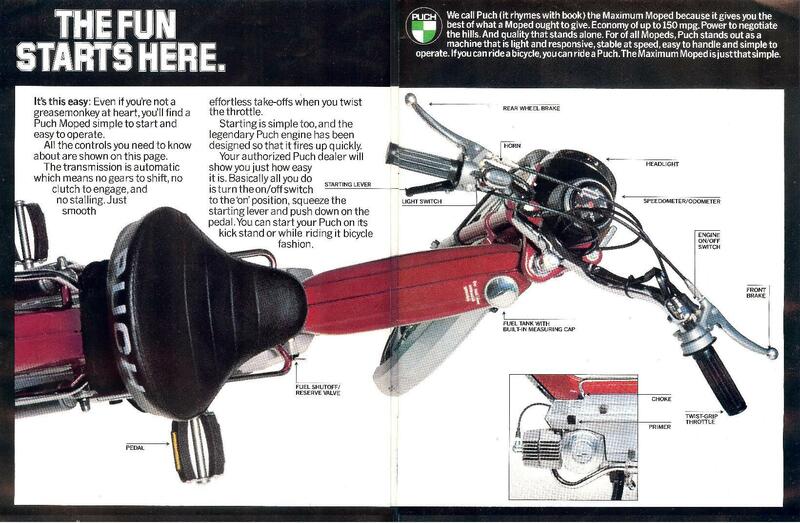 The 70’s had silver with chrome levers, 80’s were black with chrome levers. They had built-in (integrated) switches. 70’s grips were grey ribbed 100mm long, 80’s were black ribbed 100mm. You are currently browsing the archives for the Handlebars category.